Co-author of various technical publications (including tumour manuals of the TZM) and author of book chapters. provides the entire diagnostic and therapeutic range of services associated with modern oncology. Aside from superior professional competence, the practice is characterised by a relaxing and pleasant atmosphere. In addition to professional care, Dr. Michl attaches great importance to the support of her patients for the emo-tional coping with their disease. Her consultation and care approach includes the patient’s family, establishes contacts with self-help groups and consulting services, psycho-oncologists and home care services and takes into account the patient’s respective personal and professional environment. Dr. Michl’s treatment philosophy is based on the pretence to treat every patient individually based on the latest scientific insights gained by evidence-based medicine. For this purpose, a therapy concept is developed which takes into account the patient’s respective concomitant illnesses as well as the personal situation. This type of virtually all-encompassing care concept also applies to the field of palliative medicine; active and comprehensive care for patients and their family once the illness is no longer curable. To be able to offer the latest treatment approaches, Dr. Michl helps her patients enrol in various national and international therapeutic studies. In addition, Dr. Michl is a member of different interdisciplinary tumour boards and closely cooperates with the Tumour Centre Munich (TMZ). This is the reason why she is always up to date on the latest scientific insights associated with cancer therapy and actively contributes to the development of new approaches. To ensure rapid and targeted diagnostic procedures and the immediate introduction of the respective therapy, the practice features its own laboratory. The day clinic is another important component of the practice in which the necessary infusion therapies can be administered. 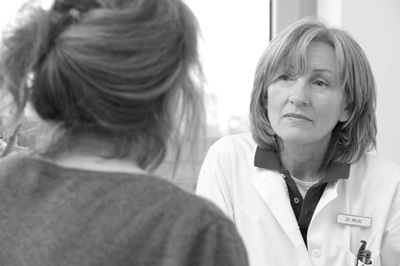 Dr. Michl is supported by a team of experienced nurses. For the optimal care of her patients, she additionally attaches great importance to the close exchange with her colleagues from the general practitioner’s practices and hospitals in charge of the patients. Dr. Michl hopes to make her patients and their families feel that they are in good, trustworthy hands and to cre-ate the best possible framework conditions to help them overcome their disease. Dr. Michl is caring for patients with statutory and private health insurance coverage. Her practice is certified ac-cording to the quality management DIN EN ISO 9001:2000.